Jason (Steve Burton) and Sonny (Maurice Benard) were discussing Shiloh (Colby Ryan McLaughlin) and Dawn of Day when Sam (Kelly Monaco) entered to tell them to hold off eliminating Shiloh while she continued working her con on him. Sam told them Margaux was a DOD follower. Kristina (Lexi Ainsworth) brought Shiloh the $10,000 DOD fee. After Sam left, Jason told Sonny they’d be better eliminating Shiloh now and dealing with the fallout later. As Anna (Finola Hughes) watched, Maxie (Kristen Storms) and Peter (Wes Ramsey) finally admitted their feelings for each other and kissed. 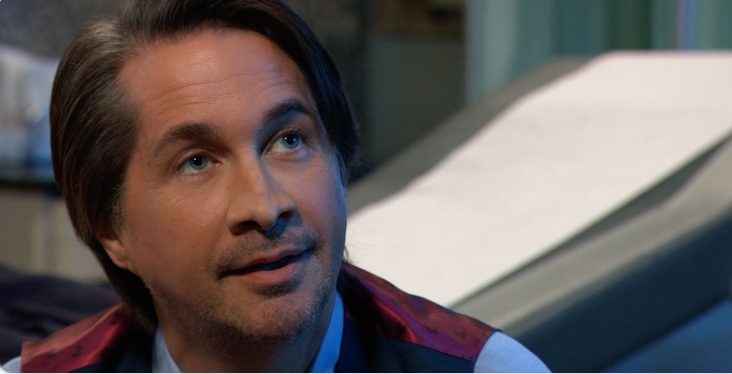 Unfortunately Ms. Devane’s interest in her son’s love life rained on Finn’s (Michael Easton) parade as he wanted to propose. Lulu (Emme Rylan) arrived at The Floating Rib and told Maxie and Peter she and Rocco were leaving Port Charles in the morning. Lulu asked Peter for some time off. Peter told Lulu he couldn’t give it. Peter told Lulu her job would be awaiting her return, also suggested she write a book about her experience with Ryan Chamberlain. Alexis discussed Kristina and DOD cult with Dr. Burns. He urged her to do nothing as any action on her part would only make DOD more appealing to her daughter. Willow (Katelyn MacMullen) told Chase (Josh Swickward) about the meeting between Nina (Michelle Stafford), Valentin (James Patrick Stuart) and Principal Schultz and how she was almost fired. Shiloh arrived and Chase reminded how Willow didn’t want to see him. We learned that Willow’s real name was Kelly. Shiloh said he came by because he didn’t have Kelly’s address. He gave her an old photo of them together and reminded how happy she was in the DOD family. Kristina told Sam there was a next level DOD event happening that night. Sam met Harmony who ran the DOD branch out of Beecher’s Corners. Daisy took Harmony to the attic to prepare for the event. Peter thanked Anna for talking with Maxie. Dr. Burns showed up at Sonny’s office. Robert (Tristan Rogers) told Anna the implanted memory must be significant. Willow showed Chase her Dawn of Day brand/tattoo. Sam came back to the DOD house and realized someone was getting a tattoo. At The Floating Rib, Willow (Katelyn MacMullen) told Chase (Josh Swickward) he was the first person she ever shown the tattoo. When Michael (Chad Duell) joined them, Willow questioned him whether his sister was getting in any deeper with Dawn of Day. Sam came to the DOD attic and went through a bag, realizing someone was getting a tattoo. Dr. Neil Burns arrived at Sonny’s (Maurice Benard) office and questioned why Corinthos called him to his office. Sonny explained that his daughter Kristina (Lexi Ainsworth) was involved with this group Dawn of Day and getting pulled in by its leader. At the DOD house, Shiloh told Harmony he found Kelly but she was now going by the name Willow. Meanwhile, Willow explained to Michael that members who became part of DOD’s inner circle was initiated into something called ‘The Trust’ and once they were in it was hard to get out. Sam had to hide when she heard Shiloh and Harmony approaching the attic. She overheard them talking about Kristina’s initiation and how Kristina provided a good trust offering with information on her family that could be useful later. Jason left after Sam texted him. Dr. Burns confirmed that DOD was a cult and Sonny asked Burns’ help in getting his daughter (Kristina) out. Neil was reluctant as the last time he tried wasn’t successful. Sonny pleaded explaining how he failed to help his son before it was too late. Michael left Chase and Willow when he received a text from Jason. Outside The Floating Rib, Jason and Michael met with Sam and the three shared information about what they learned about DOD and The Trust. Sam told them that Kristina’s initiation was scheduled for that night. Jason decided that he would get Kristina out before it happened. Michael went back inside The Floating Rib to chat up the bartender in order to establish an alibi. Jordan (Briana Henry) told Curtis that as Margaux was closing the case on Ryan Chamberlain believing the severed right hand was indication he was dead, Commissioner Ashford asked her PI husband Curtis (Donnell Turner) to go to Canada to verify himself. Especially since the autopsy revealed Ryan’s hand could have been removed on purpose. Ava (Maura West), Felicia (Kristina Wagner) and Laura (Genie Francis) met about the one thing they had in common: Ryan Chamberlain. They decided to lure Ryan back to Port Charles (if he were still alive) by pretending Ava had moved on with a new man. Harmony gave Kristina a gown to wear for the initiation. Shiloh told Kristina that although he wouldn’t be there at her actual initiation ceremony, they’d have hours to discuss it afterwards. Chase (Josh Swickward) and Willow (Katelyn MacMullen) returned back to his apartment where he had a bottle of wine he wanted to share with her. He talked about the specialty wine shop where he purchased the wine adding it was from a vineyard in Italy and was the vintage of love. Willow remembered when they first met and commented how after Shiloh she didn’t think she could trust another man romantically. But she trusts and feels safe with him. Chase told Willow he wanted her if she wanted him. Willow assured she did and they made love. Anna (Finola Hughes) looked at a photo Robin sent her and commented to Finn (Michael Easton) that her children and grandchildren are the most important people in the world to her. But what if they aren’t really her children and grandchildren? Anna wondered whether Alex (also Hughes) hated her because Anna got to raise her child: What if Robin (Kimberly McCullough) wasn’t her daughter? Finn tried to assure Anna she was worried over nothing but if it were true, it wouldn’t change anything for her. Peter (Wes Ramsey) brought Maxie (Kristen Storms) home. She said they had to plan their next date as she spending the evening talking with Lulu (Emme Rylan) didn’t count. Maxie asked Peter whether he was staying or going then invited him in. They talked about the night James was born. Maxie thanked Peter for what he did helping to bring her son into the world. As they kissed, Maxie and Peter were interrupted by James’ cries. Maxie left to take care of her son. Peter eyed the photo of Maxie and Nathan on the mantle. Alexis (Nancy Grahan) arrived at Sonny’s (Maurice Benard) office. Sonny told Alexis their daughter was drowning and they had to keep her afloat. Alexis told Sonny she had a new therapist who was helping her with what to do about Kristina. They also talked about whatever their relationship was and how it may have damaged Kristina. Kristina was nervous about her initiation. Shiloh (Colby Ryan McLaughlin) assured her she’d be fine. Harmony (Igna Cadranel) gave Krissy something to drink to help calm her nerves. Sam (Kelly Monaco) called Shiloh saying because of Jason (Steve Burton) she didn’t think she could come to another Dawn of Day session. She asked him to meet her at The Floating Rib. With Shiloh out of the DOD house, Jason could go in to retrieve Kristina. He promised not to leave that house without her. Maxie told Peter that James had a nightmare but she was able to get him back asleep. He knew about Nathan and Spinelli, Maxie asked Peter about his past relationships. He admitted that he’d never been in love but was eager to find out what it was like. He added he’d wait until she was ready. Jason found Kristina in DOD attic and picked her up. Sam pretended she was getting drunk over Jason as she and Shiloh talked at The Floating Rib. She received a text from Jason that read ‘Got Her.’ Harmony came to the attic and found Kristina missing. She texted Shiloh that Kristina was gone. A groggy Kristina saw Jason and asked what was going on. He answered he was taking her somewhere safe as he carried her out of the house. Alexis spoke with Sonny (Maurice Benard) on the phone and he told her Jason (Steve Burton) had Kristina (Lexi Ainsworth) some where safe. Molly (Haley Pullos) came to Charlie’s Pub looking for Kristina. Julian (William deVry) told her that Kristina texted that she’d be out from work today. At one of Sonny’s safe houses, Kristina woke up on the couch and asked Jason what happened. “You were some place bad and I got you out,” Jason answered. Realizing Chase (Josh Swickard) was noticing her tattoo, Willow assured it didn’t bother her anymore. “It’s like you were branded,” Chase said. At the Dawn of Day house, Shiloh (Colby Ryan McLaughlin) and Harmony (Inga Candranel) speculated on what could have happened with Kristina that made her change her mind about her initiation. When Sam (Kelly Monaco) arrived, they asked Ms. McCall whether she heard from Kristina. Sam said Kristina leaving before her initiation and not saying anything was classic Kristina and they shouldn’t be concerned. Molly entered and demanded to talk with her sister saying Kristina texted she wasn’t coming to work. Molly was furious with Sam when Shiloh told her that Sam was a DOD follower. Molly told Shiloh the Dawn of Day book was obviously written by a narcissist. Molly stormed out and Sam followed. Ms McCall assured she’d never let anything come between she and Krissy and smiled after Molly walked away, proud of her younger sister’s determination to protect she (Sam) and Kristina. At General Hospital, Oscar (Garren Stitt) awoke from his coma. Dr. Terry Randolph told Kim (Tamara Braun) and Drew (Billy Miller) that the growth of the tumor left their son’s right side compromised. Monica (Leslie Charleson) told Kim she and Oscar could stay at the Quartermaine mansion for as long as they liked. Carly (Laura Wright) comforted Josslyn (Eden McCoy) who tried to be strong when she learned of Oscar’s condition. Later, Josslyn visited Oscar in his hospital room and tearfully asked where he’d like to spend the last days of his life. Michael came to Chase’s apartment and talked with Willow about speaking with Kristina to get through to her about DOD. Michael assured he and his father could protect Willow if she helped Kristina accept the truth about DOD. Kristina demanded Jason take her back to DOD but he refused. When Sonny arrived, Kristina ran into her father’s arms asking for Sonny to take her back to the DOD house but he refused. Kristina warned she’d talk with her mother and was shocked when Alexis (Nancy Grahan) entered as she’d been in on it. Harmony realized Shiloh’s DOD cup was missing. Shiloh ordered Harmony to find the cup or they’d be screwed. Jason took Shiloh’s cup when he rescued Kristina. Dr. Neil Burns told Alexis and Sonny that Kristina would be lost to them forever if she refused deprogramming and returned to DOD. Sam called Jason, telling him what happened with Molly. Jason said it would be hard breaking Kristina from DOD’s hold. Spencer (Nicholas Bechtel) told Laura (Genie Francis) he had to find Lucy (Lynn Herring) or Epiphany (Sonya Eddy) because he had ideas for the Nurse’s Ball. Finn (Michael Easton) practiced proposing to Anna (Finola Hughes) using a medical skeleton. At Charlie’s Pub, Sasha (Sofia Mattsson) sat down with Maxie (Kristen Storms) and Peter (Wes Ramsey) who offered their apologies for running the DNA test. Sasha understood their reasoning for protecting Nina (Michelle Stafford) but assured that Valentin (James Patrick Stuart) loved Nina and wouldn’t try to hurt her. Valentin helped Spencer get something from the vending machine when it appeared jammed and commented that Charlotte (Scarlet Fernandez) said young Cassadine was back. Valentin threatened to make a call to the electoral board so they’d learn about Spencer’s conversation with Charlotte where he hinted he was sure Laura would win the mayoral election. Laura smiled when she saw Finn practicing his marriage proposal. She knocked on the door and interrupted. Laura asked Finn’s medical opinion whether Ryan (Jon Lindstrom) could still be alive even with his severed hand. Finn said with proper medical attention it’s possible. Afterwards, Finn showed Laura the engagement ring for Anna and Laura said Anna would love it. Anna invited Robert (Tristan Rogers) over for tea and asked him whether it was possible Robin (Kimberly McCullough) was Alex’s (also Hughes) daughter. Even though Robert had initially been attracted to Alex, he was certain that Robin was his and Anna’s daughter and that because Anna was never punished for being a double agent, she wanted to punish herself now. Curtis (Donnell Turner) asked Nina whether Crimson ran the piece looking for a kidney donor for Jordan (Briana Henry). Nina said the magazine had but so far hadn’t come up with anyone who could help. Still reeling from Maxie running the DNA test on Sasha, Nina later gave her a hard time at work. Sasha arrived at Crimson office and told Nina she should forgive Maxie as Sasha had. Sasha added she understood why Maxie did what she did and would want Nina to forgive her (Sasha). Because the public believed Ryan Chamberlain was dead and he was declared legally declared dead in absentia, the judge granted Nora Buchanan’s (Hilary Bailey Smith) motion to drop all charges against Kevin and warned Margaux (Elizabeth Hendrickson) that if the D.A. pursued case any further she’d be wasting the taxpayers’ money and doing it for headlines. Valentin told Laura because Lulu (Emme Rylan) left no word with the court prior to her departure and he had partial custody, he wouldn’t discuss a visitation schedule. Peter apologized to Valentin for believing he’d trick Nina with Sasha. Kevin told Laura the charges against him were dropped and now he was going to do an appeal to the GH board to be reinstated. Even with the severed right hand, Kevin told Laura he couldn’t say with any certainty that Ryan was dead. Meanwhile as Ava (Maura West) grabbed a coffee at Charlie’s, someone watched her.